Thank you for considering my question in your online discussion. Further thanks for the invitation to contact you with further comment on linguistic rights pertaining to the Scots Language. I write to you as an individual. I am an early career researcher in auditory communication, a participant in Scots language communities and a first language Scots speaker. I could relate to you a vast number of personal or second hand anecdotal testimony of linguistic prejudice in education and the wider community, but I would like to focus on some of the research that has been done into Scots language that may be particularly relevant to linguistic rights.1 For further research and opinion I suggest contacting the organizations listed at the end of this document. I also wish to state my opinion that although Scots and Gaelic linguistic rights may be addressed within the context of general linguistic rights, they are languages that are native to Scotland we have an additional moral obligation to protect and preserve the languages and the rights of those who speak them. Subsequently, I offer some interpretive opinion on why I believe speakers of Scots language need protection in a human rights context. I understand there is a limitation to time for submission of comment, so I present this in the knowledge that it is a rough overview of opinion and not a full research document. Scots is a West Germanic language spoken in Scotland. It is recognised as a language by the Scottish Government, the UK Government and the European Union. It is protected under The European Charter for Regional or Minority Languages – part II, but not yet part III.2 Presumably it should also be protected by articles 2, 10, 19 and 26 of the Universal Declaration of Human Rights; The International Covenant on Civil and Political Rights; and the Universal Declaration of Linguistic rights. 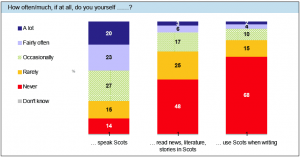 In the 2011 census a question on Scots was included. As the findings of this will be self reported usage of Scots, the attitudes towards Scots outlined below are expected to be reflected in the results. Scots and Gaelic have also been included in two draft constitutions for Scotland, in one case as a rights issue. It has a continuous literary tradition, traditionally dated from 1375 to the present5. It has its own grammar6, phonology, orthography and 22 volume dictionary of words7. In 1996 it was estimated that 1.5 million people in Scotland speak Scots.8 In 2010 research carried out on behalf of the Scottish Government 85% of those surveyed identified themselves as speaking Scots at some point, the data is shown in figure 1. When asked the degree to which Scots was spoken in their neighbourhood two thirds agreed that it was spoken “a lot”, however there was a significant difference across NRS social grade groups. Scots has a written form, however this is not systematically taught in schools. 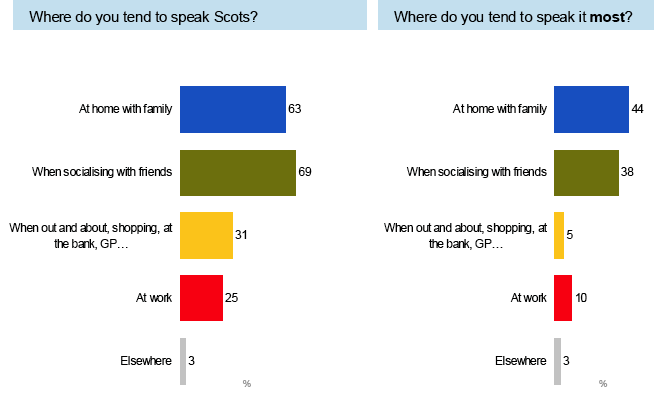 It should be noted from figure 1 that 68% of those surveyed never write in Scots, with only 2% claiming regular use. There are currently no Scots language medium schools. 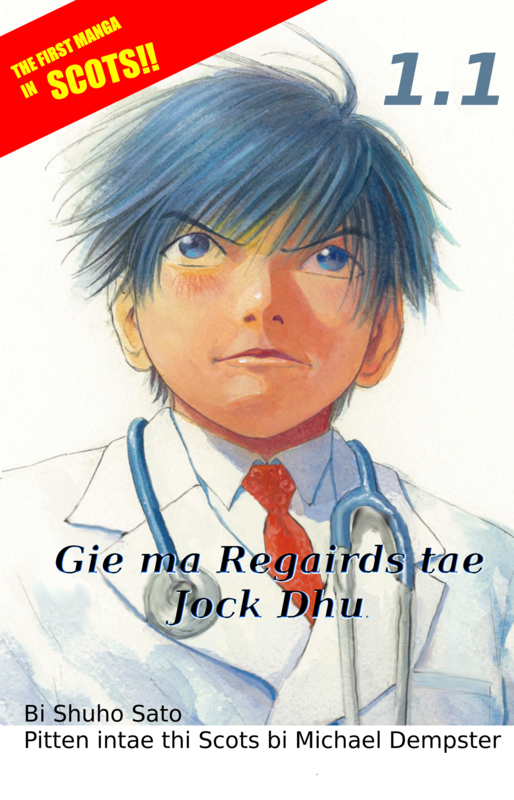 In written media Scots has suffered a relatively recent decline in extended prose19 with Scots being identified as being used as a tool for negative characterization “see Unger 2004 for further discussion of how Scots can be used for characterization in fiction, e.g. representing Scots speakers as uneducated, tough etc”20 Although there is continued prose use in the sole Scots language journal, Lallans, and online communities, in particular see the Scots Language Centre’s website. It may also be noted that as Scots language policy is left to the presenters to decide, given education is in the medium of English, the dominant ideologies towards Scots may determine their personal approach to how they best use language. There are three findings from the “public attitudes towards the Scots language” study that indicate that speakers of Scots face delegitimization and being negatively perceived when using their natural speech. A picture that emerges from the studies shown above is that Scots is spoken by a large number of people in Scotland, but most people remain illiterate in Scots. Spoken Scots is linked to socio-economic status and it is available as an indicator of social standing. There is a strong minority who are opposed to it being used in schools, and its usage is significantly reduced in more formal settings. I don’t believe that it would be a great leap to interpret this as suggesting that Scots is deemed inappropriate for social interaction outwith family and friends. When combined with the substantial numbers who hold “negative perceptions” about Scots and the view that Scots is “not important” this suggests that there may be a social impediment to those who use Scots inappropriately. As Scots is spoken at home and with friends this will continue to be the first language children acquire in up to 85% of households in Scotland. With there being no Scots language medium schools or nurseries in Scotland children’s first experience of interacting with the wider world will be, in the best case a lesson that their language is valued, but not appropriate; or in the worst case that it is wrong and bad. I have been unable to find research on the number of people who are monolingual in Scots, those who are unable to speak the standard of English required by our education system. However, I do suspect that this may be reflected in Scotland’s literacy figures. From my own teaching experience I have found that making the distinction between Scots and English language helps learners with English literacy. This observation is also noted in the report by Itchy Coo. By specifically recognising and protecting Scots speakers right to full expression in their own language, spoken and written, I believe we can encourage people to “come to voice” about a wide number of unspoken rights issues and work towards a more engaged Scotland.